I got this idea on how most people love their brownies to be served in a typical American restaurant...warm chocolate brownies with vanilla ice cream and rich chocolate sauce and so I have decided to combine all together as one ice cream mix! This eggless ice cream is so easy to make that anyone can make this easily without an ice cream maker. And the next best thing is to watch my son squeals in joy whenever my husband scopes a cup of this ice cream for him... LOL! 1. Mix condensed milk and cream until combined. 2. For the chocolate swirl, place chocolate in a microwave-safe bowl. Microwave on high (100%) for 1 to 2 minutes, stirring with a metal spoon every 30 seconds, until smooth. Set aside for 5 minutes or until cool. Stir in thickened cream and mix until combined. 3. Pre-chill the ice cream mixture, chocolate mixture and chopped brownies as individual in fridge for more than 4 hours or overnight before the assembly of ice cream. 4.Using an electric mixer, beat the ice cream mixture together for 5 minutes or until soft peaks form. Alternatively, using an ice cream maker, pour the ice cream mixture into the ice cream maker and allow the maker to stir until the ice cream texture forms. 5. 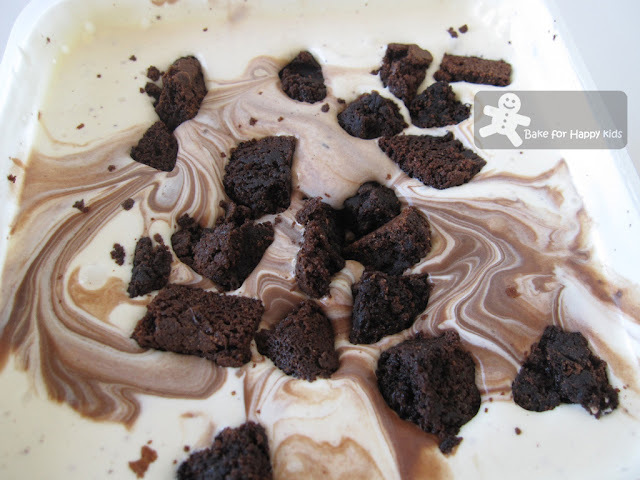 When the ice cream mixture is thicken by electric mixer or ice cream maker, stir in 3/4 of the chopped brownies biscuits. Spoon mixture into an container. Pour the chocolate mixture on top the ice cream mixture and swirl the chocolate to create swirl pattern on top of ice cream and sprinkle the remaining brownies on the ice cream mixture. Freeze, covered, overnight or until firm. Serve. Yummy!!! I'm also squealing in joy at the thought of this!! 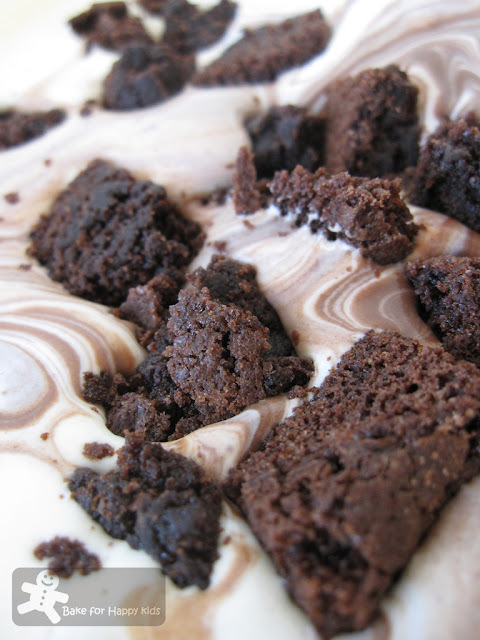 Your ice cream looks so creamy and delicious with the brownies! No wonder your son is so happy! whoah this recipe is a sweetie! =) everything look soooo gooood!! Hmm..mm...OMG, this is simply irresistible! Thanks for sharing such luscious recipe. gosh, i just wish i can this right away!!! Ooohh, that ice cream rocks! Wow, I just want to dunk my face in this and eat the whole thing! oh id squeal in delight for that too...the first photo, i just wanna swim in a pool of that!! lol. Wow! That is some serious ice cream. Great idea to blend a brownie sundae into an ice cream. Mmmm! Brownies and ice cream- two of my favorite food groups together in one treat! :) This looks so good. I love the brownie chunks and the chocolate swirl.